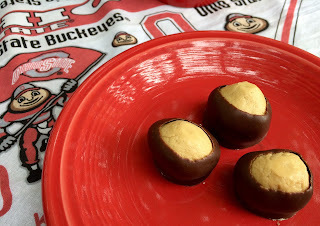 I have never posted my recipe for Buckeyes, which are a peanut butter candy, dipped in chocolate, and beloved by Ohio State fans! My daughter made these and shared them with me. This is the same recipe that I use for my Peanut Butter Easter Eggs. On my table, you can see Brutus Buckeye, the mascot, holding the Ohio State fan. Ohio State is my alma mater, and my four children were born in Columbus, Ohio, and still to this day are OSU fans. This picture is of "real" buckeyes, which my dear dad collected from the Ohio State campus, probably 40 years ago. Yes, I'm sentimental like that, and have saved them all these years. You can see that the candy Buckeyes really resemble them, can't you?! These are such a hit! Mix candy ingredients together until smooth. I do this in my mixer. Form the peanut butter mixture into balls, and place on wax or parchment paper, and onto a cookie sheet. You can now put these in the freezer for about 30 minutes to get really cold. You also can put them in the fridge to do later. Melt the chocolate chips with the shortening. I keep the melted chocolate in a bowl & place that bowl in another bowl of warm water. This way the chocolate stays smooth. Don't get any water into the bowl of chocolate! Use a toothpick and dip the buckeye into the chocolate, leaving a space at the top to resemble a real buckeye. You may find that using a fork underneath and dipping the ball into the chocolate is easier. Place back onto wax or parchment paper to firm up. Store in the refrigerator. I have never heard of buckeyes.....they do look delicious, Kitty. Your buckeyes look good, Kitty. You know, I didn't know what buckeyes were so I looked it up. I thought they looked like chestnuts and it turns out they are a form of chestnut or horse chestnuts. Apparently young boys often carry them in their pockets for good luck! I love peanut butter and chocolate together. Wish my hubby did! A fun post. Happy Autumn, dear Kitty! We have a very good friend who is from Ohio went to Ohio State. He is also a very good golfer and was a professional for a while before he married his wife. He's probably a little older than you...his name is Alex Antonio. I've never had buckeyes but they look delicious! Who doesn’t love the combination of peanut butter and chocolate? I have eaten these before, but I have never had a recipe for them, and thank you for posting this one. They look like heaven. At the moment I am out of chocolate chips (can you believe it? ), so a Sam’s run for one of those big, cement-size bags is in order. Love those buckeyes and so does my hubby, both the team and the candy! I used to make these every year for Christmas...of course, being form Ohio myself, I knew what a real buckeye was...a worthless nut! LOL! Love the display for your goodies! You did a fabulous job making those to resemble the real deal. How precious that you have kept those all these years, your dad would be honored. Oh, my word! As you know, I am from Ohio, too, and YES, we used paraffin, too! Oh, my, how I praise God for protecting all of us when we didn't even know we needed to be protected! Unbelievable. I think you recipe is exactly the same as the one my dear Mom and sister and I have used for years. It is very similar, if not the same. That is SO precious that you have those buckeyes your dear Daddy picked up with his own hands at OSU! What a neat story and addition to this post! You know what? I couldn't tell that they were not your candy buckeyes! They look so much the same. I really loved this post, sweet friend. It is always such a blessing to come here to your lovely, uplifting blog and visit. Sending much love and many hugs your way and praying for you and SO thankful for your prayers! How fun! Love your team spirit. Those buckeyes look melt in your mouth delicious. Sweet story about your buckeyes from your Dad! Hi Kitty, I have never had these before. They look so good and I bet taste delicious. Thanksfor sharing this at C&C with J&J. I have always wanted to make these, but I just haven't. After seeing your pictures I told myself I really NEEDED to :) These look oh-so-tasty, my friend. Enjoy your day! Much love to you! You can't beat the yummy combo of chocolate and peanut butter! 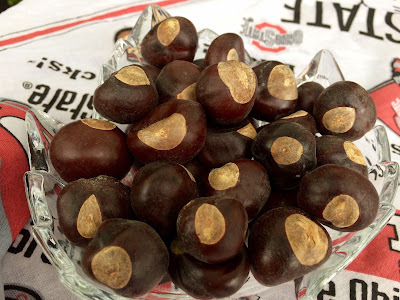 Are real buckeyes similar to chestnuts? I like buckeyes but your recipe looks much better!!!Mouthwatering!Hugs! There is nothing like them. The team AND the candy haha! I only make these at Christmas time but heaven help me if I don't. ONE year I decided not to make them. It was as if I had said there will be no Christmas this year lol. I've heard of Buckeyes, but never really knew what they were - neither the candy nor the tree things. They do sound delicious (the candy variety). I think the other kind would likely break a tooth. GO BUCKS!! My sisters make these every year, so I have not had to do them, but I’m happy to snag your recipe for future use. Thanks for sharing it & all your cute OSU items. Kitty, I *love* that you have kept your dad's buckeyes all these years! I would have, too! Hi Kitty, I must say I have never eaten a buck eye but they look really good. I like chocolate and pb so I am sure I would love them. Are the real buck eyes like chestnuts? 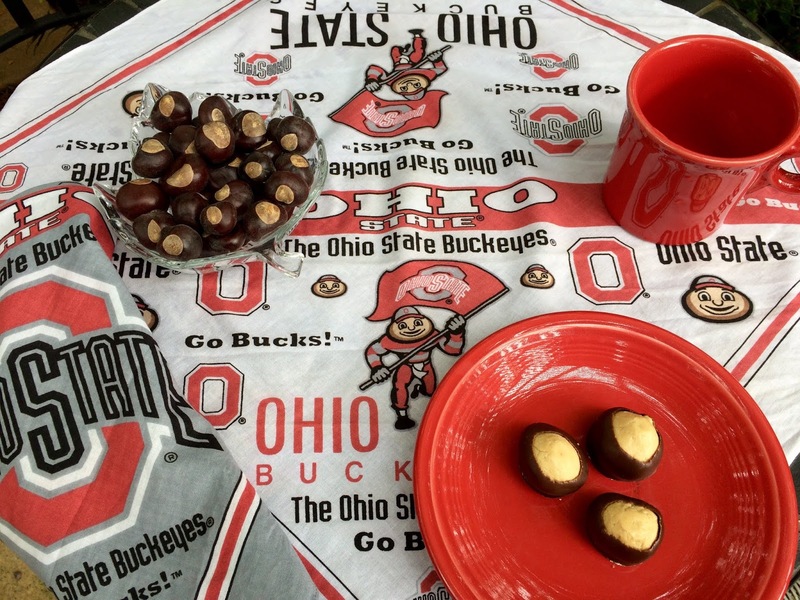 Your Buckeyes look awesome, and perfect for the season! Thanks so much for sharing with us at Full Plate Thursday and have a great week! My cousins from Columbus are big Buck Eye fans and I had some of these when visiting them. YUMMY! Thanks for sharing with SYC.